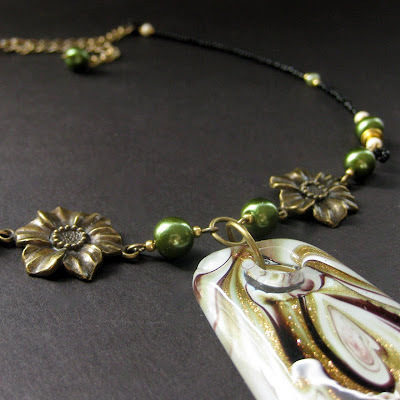 A lampwork pendant of earthy swirling colors is joined with matching beads, bronze flowers and just a hint of golden accents. This beautiful necklace is OOAK. The clasp at the nape hooks to a chain that allows this necklace to be worn tight enough to be a choker or loose enough to lie against the chest while a small beaded stone bauble at the end of the chain gives an extra bit of decorative touch.